I dropped these in the mail today so they're on their way to the mid-West. Hopefully our friend, David A., will get some good use out of them this winter! These are made from Lion Brand Fisherman's Wool in Natural Brown. This is the same yarn I used to make the wool beret. Here's the beret in progress. 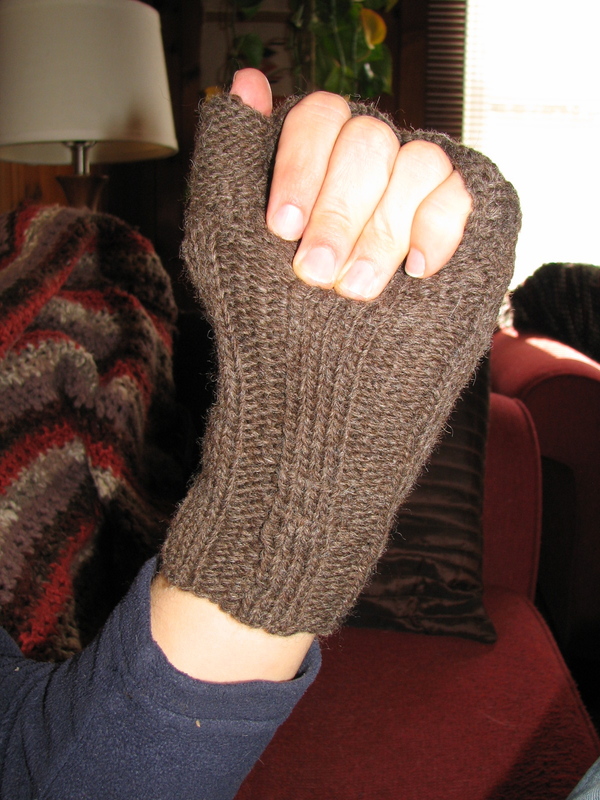 The gloves are based on my "Hubby's Fingerless Mitts" pattern I created last year. 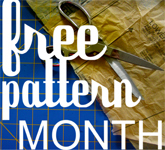 I designed the pattern for Chris and made a size medium for him last year. What's Needlin' Ewe's 2011 Sweater Challenge Update: I've decided on my first sweater. It's Kim Hamlin's "Lattice and Hollow Cardigan" from Interweave Knits Spring 2010 issue. 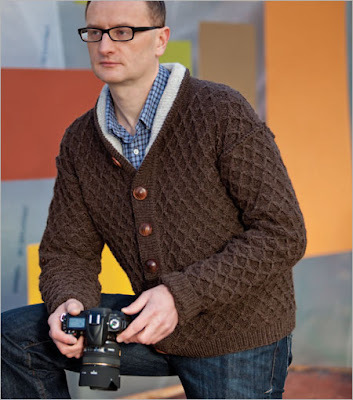 This photo belongs to "Interweave Knits." Click on the links above to visit the magazine's website to buy the pattern or the Spring 2010 issue. Chris picked out burgundy and navy-colored merino yarns from Malabrigo. I'll keep you posted as I get it going. The challenge's goal is to knit a sweater every two months so there will be six sweaters by the end of December. So I've got six weeks to knit this one up! Those gloves are awesome! You should start an etsy shop (unless you already have?) with some of these items! I would love a pair of these gloves for Josh! Also, he was looking over my shoulder and mentioned how much he really liked this sweater too. Cant wait to see your finished project!! @ChelseyThanks! I do have an Etsy shop, but I've never listed anything in it. @~ Dawn Sparks ~ Thanks!